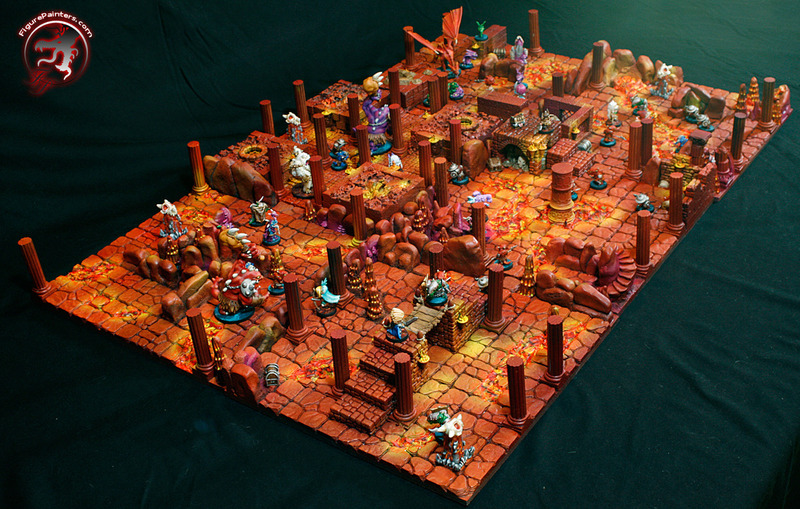 With my new found obsession with Super Dungeon Explore I love to see what people are doing with the miniatures. 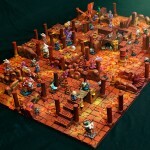 So when I found the Super Dungeon Explore boards made by Tyson Koch of FigurePainters.com I was just blown away. These boards look fantastic and they really give off the feeling of a great dungeon crawl. As I usually do when I find something that inspires me, I contacted Tyson for an interview. Read on for the full interview, and don’t forget to check out his site for more pictures of not only the Super Dungeon Explore board but tons of other amazing works as well! In addition to the card games that I have reviewed recently I have also been playing several board games. 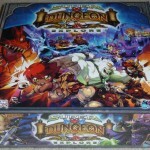 Among these is Super Dungeon Explore from Soda Pop Miniatures, which crosses the board game boundaries and heads straight into miniatures territory with a cute chibi anime style. It’s been a while since we’ve done any interviews. 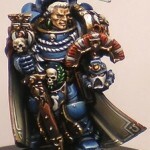 However, I happened across an amazing conversion recently and just had to interview it’s creator. 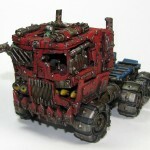 Some of you may have already seen the Orktimus Prime, a conversion of the Ork Trukk model into a working Ork Optimus Prime Transformers model. This is the brilliant work of madscuzzy (aka Dom). If you haven’t seen it yet, well, it’s something you just have to see. I can’t really describe how great it is. This is one of my favorite conversions that I’ve seen. It’s a great idea and madscuzzy did an amazing job with it! It turns out that he’s also done some other very fine work as well! I was very impressed with all of his conversions, and the great trench table that he built. Check out the interview below to learn all about Orktimus Prime and the man behind the machine. I finally finished up my next model, Madam Sybelle. 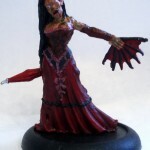 If you have not played Malifaux, she would be the head of the Resurrectionist’s Rotten Belles essentially. While not my best model, she came out well enough I think. Undead Ladies of the Night! It’s been a while since I’ve put up any photos of my projects (because it’s been a while since I’ve had a chance to do much work on any of them mainly). 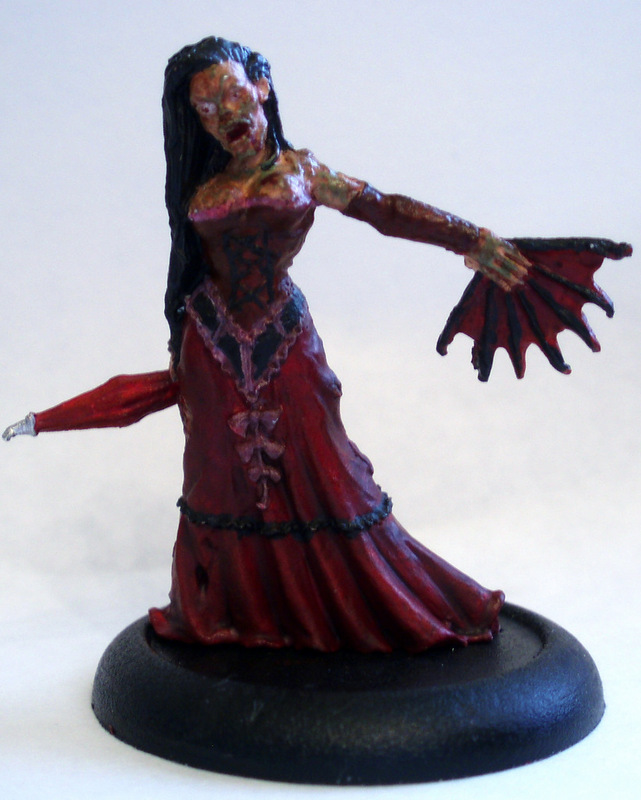 I just finished the painting on my first Malifaux miniature tonight, an undead lady of the night. I still need to decorate the base, but the painting itself is done. It’s about time for another interview. This time we’ve got UnderBheit. UnderBheit received the third place Bronze Tom award as well as several honorable mentions in the Golden Tom 2008 competition. More recently he has been painting and playing something that’s had my interest, Malifaux. It’s interview time! This week we’ve got probably the most requested interview so far. Thomas List (aka Admin Tom) is the creator of Tom’s Boring Mordheim Blog/Tom’s Boring Mordheim Forum. Obviously, he has been a very important person in the Mordheim community. On top of his incredibly influential forums blog/forums, he is a very talented painter. Lucky for us he decided to share some of his tricks in this interview! We had a very good response to the first interview so it looks like we’ll be continuing the segment. This time we’re going with someone a little more focused on rules. cianty is one of the creators of the Border Town Burning supplement to Mordheim. He has had his hand in various other Mordheim projects as well. He is also a moderator on Tom’s Boring Mordheim Forum, the Specialist Games Forum and the Mordheim Yahoo group. On top of all this, he does excellent work with miniatures and especially terrain. So, here we go with our second interview! Powered by WordPress v 5.1.1. Page in 1.003 seconds.